The scene under the relentlessly hot Qatari sun is slightly surreal. 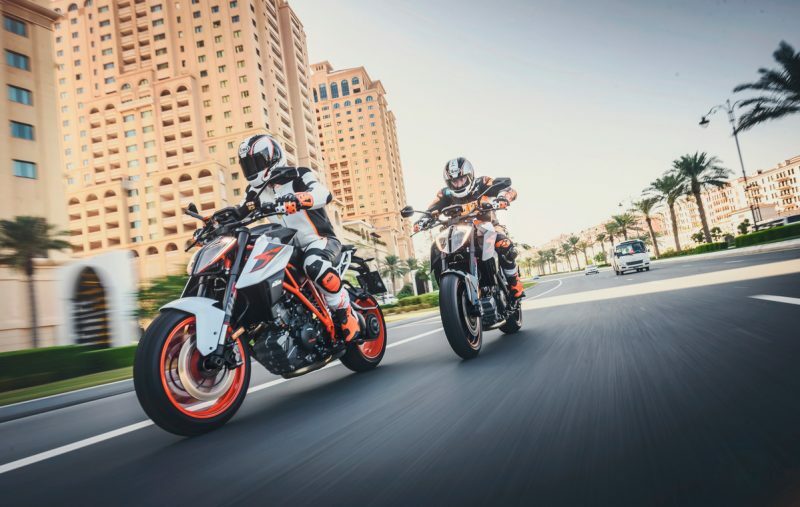 I’m following a line of five KTM 1290 SUPER DUKE Rs, identical in all but paint color, as we prowl the streets of the capital, Doha, flicking into the innumerable small roundabouts then accelerating out again with a rumble of V-twin exhaust sound. You don’t see many big bikes in downtown Doha, let alone any shiny orange-and-white projectiles resembling some giant insect, thanks to their aggressive split-headlamp glare and sharply creased bodywork. There’s some adrenaline flowing, and part of me wants to try and recreate some of the urban aggression for which the original SUPER DUKE earned an unmatched reputation. But the streets of ever-expanding Doha are slick with construction dust, the police are notoriously intolerant, and it’s best to be wary of the drivers. Despite the hazards and the heat it’s still great to be getting a first-ever street ride in Qatar, after coming here numerous times before to test bikes at the Losail International Circuit. 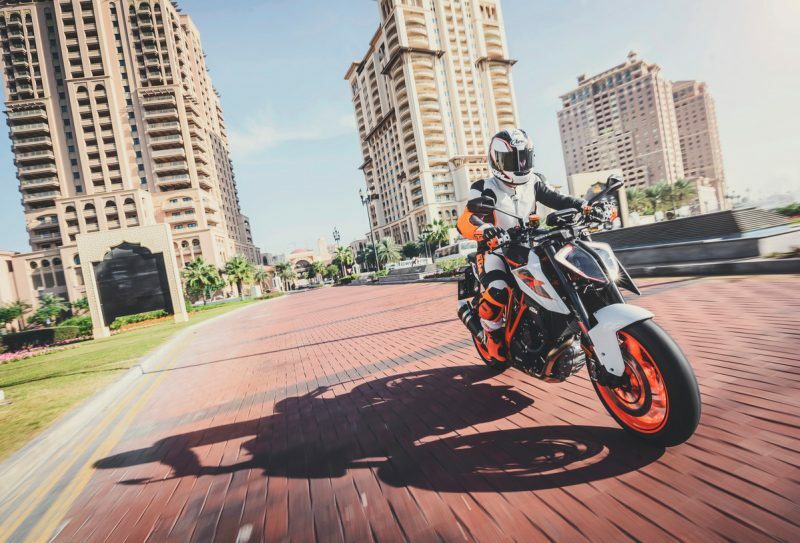 Especially on a super Naked Bike like the KTM 1290 SUPER DUKE R, which combines serious stomp with road-going manners and a riding position sufficiently upright to generate some cooling breeze. 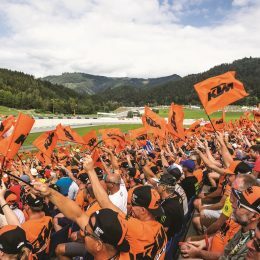 The intention with this R-model update, we’re told, is to make the KTM 1290 SUPER DUKE R more sporty, following last year’s introduction of the sports-touring KTM 1290 SUPER DUKE GT. Tweaks to the 75-degree V-twin lift peak revs by 500rpm and maximum output by 4bhp, to 174bhp. New resonator chambers, alongside the cylinder heads, smooth low-rev response and cut emissions, while a revised exhaust system meets Euro 4 regulations. Chassis mods also follow the harder-and-faster route. 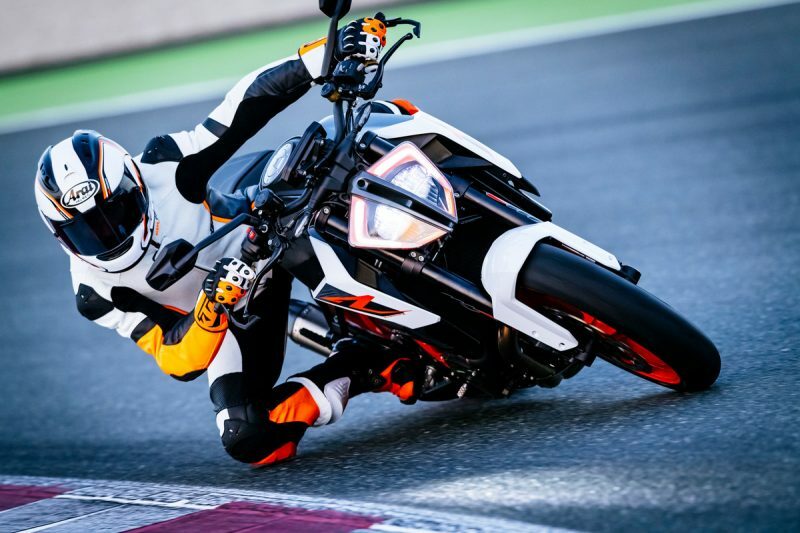 That’s all buried inside the bike but before climbing aboard there’d been no mistaking the KTM 1290 SUPER DUKE R’s new look, especially the striking, split-lens LED headlight. The key fob in my jacket pocket negated the need to turn an ignition key: just press the tip switch on the right bar to bring the colorful new TFT display to life, before firing up the engine with a V-twin bark from the low-slung single exhaust system. As before there’s a choice of rider mode, controlled by tip switches on the left bar. On the Doha streets I stuck to Street and Sport, with no need for the Rain that softens response and limits output to 100bhp as before. The launch bikes were also fitted with the optional TRACK PACK with its sharper throttle response, plus extra features including the ability to adjust throttle response, through three levels, and the amount of slip allowed by the traction control (which can be adjusted on the move through nine levels). The TRACK PACK also allows the anti-wheelie mode to be turned off independently without disabling the traction control, which the standard bike still doesn’t allow. And it adds a launch control function, which permits fast starts with the throttle held wide open, and no chance of a bad getaway or wheelie. That wasn’t needed on the Doha streets, where the superbly torquey engine and sweet throttle response helped make carving through the traffic great fun. 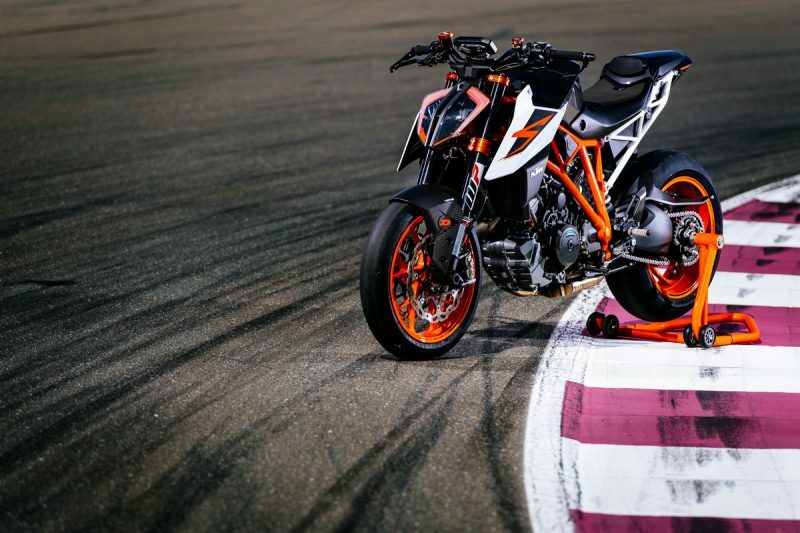 The big 75-degree V-twin engine pulled cleanly almost from idle, kept on revving smoothly towards its redline just short of 10,000rpm, and changed through its 6-speed transmission sweetly with the help of the 2-way quickshifter+, an accessory that few KTM 1290 SUPER DUKE R buyers are likely to do without. The R-model’s chassis also coped effortlessly with everything the Qatari roads threw at it. Although the KTM 1290 SUPER DUKE R has gained a few kilos due to Euro 4 regulations it’s still light at 195kg dry, and was glided through the succession of small roundabouts with effortless efficiency. Its more leant-forward riding position remained fairly comfortable, not least because the firmed-up suspension still has generous travel by sports bike standards, with an unchanged 125mm up front and 156mm at the rear. One of the KTM 1290 SUPER DUKE R´s best attributes is the way that its outrageous street performance is matched so comprehensively by its level of safety thanks to the motorcycle stability control. I knew that if necessary I could have grabbed a fistful of Brembo or cracked open the throttle in mid-bend, and the electronics would have kept the bike shiny side up. Even so, the Qatari streets were never going to allow a 174bhp Naked Bike to stretch its legs properly. So it was great to find myself back in the KTM 1290 SUPER DUKE R’s saddle a day later, this time with my helmet chinpiece on the tank as the bike ripped down the mile-long main straight at the Losail International Circuit at about 160mph, making a pretty serious attempt to pull my head from my shoulders in the process as I hung on tight into the wind. That V-twin was just as impressive on the track as it had been on the street. It churned out dollops of easily controllable grunt from 5000rpm when requested, with a useful choice of immediacy in Track mode. It stayed smooth however hard it was revved, and picked up speed so quickly, even in top gear, that a couple of times I even went for a non-existent extra cog. The KTM 1290 SUPER DUKE R also made the circuit’s mostly smooth, medium-speed turns great fun, and carved through them at a very decent pace. That high-tensile steel-tube frame is hugely rigid, and the quality of the WP suspension and steering damper is never in doubt, although on track the generous travel can give larger and heavier riders (I’m 1.93m or 6’4”) some setup issues. For the track the launch bikes had been stiffened slightly from standard settings, and the front end worked very well, giving precise steering with good control. But the shock absorber was initially much too soft for me, making the bike squat under acceleration then run slightly wide, and weave coming onto the main straight. Adding preload, low-speed compression and rebound damping tightened it up, giving much more accurate steering and calming the straight-line shakes. As I got used to the bike and the track (a couple of sessions under the lights as well negating the need for that LED) it was great to be able to try different options for the throttle response and traction control spin, all the time enjoying the bike’s near-limitless ground clearance and the fierce grip of the sticky Metzelers. The Brembo brakes were excellent too, repeatedly hauling the bike down from its top speed for the fairly slow, right-hand turn one, the ABS remaining in the background although I didn’t quite find the courage to grab a handful in mid-turn. 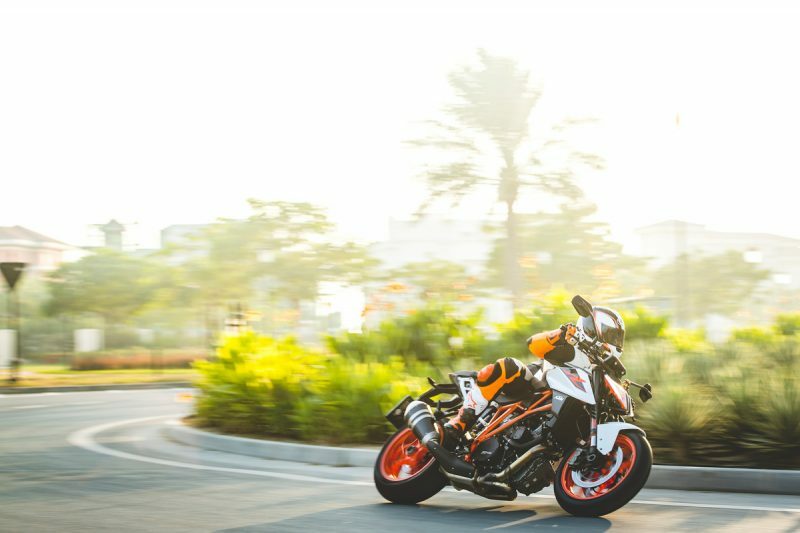 This revised KTM 1290 SUPER DUKE R flatters its rider and literally is READY TO RACE, as well as ready to rip up the street with an extra dose of attitude and V-twin performance. 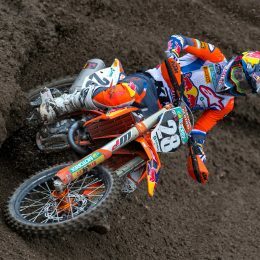 The bike that KTM are calling BEAST 2.0 is subtly quicker and sharper than its already fearsome predecessor, and gains a sportier image and edge without losing the refinement and all-round ability that was a key part of its appeal. 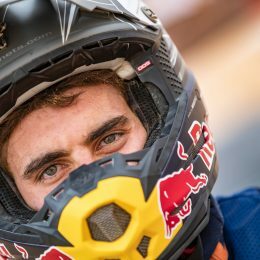 Check back next week for part two and thoughts of the pro racers! Well, I own a Triumph Explorer now which has been criticized many times for copying BMW’s GS, so I think it’s refreshing for a manufacturer like KTM to go their own way and produce something different from the run of the mill. As for the headlight, just hope it works at night unlike the Ducati Multistrada 1200 that I owned for only 6 months and so many faults, that also had LED lights which were appalling at night. It seems that many manufacturers forget that their products will be used in the dark winter months. I own 5 KTM bikes , the oldest is my2005 950 adv. i consider that bikwe to be more attractive than any of your current models. I considered the 1290 r, but bought a super clean 990 SMT , a more realistic bike. Im sorry you sto making that size bike and the upcoming twin is of no interest to me foremost because it is not a vee twin. You get a premium price, but a parallel twin is not ‘premium’ to me.